On December 1, 1942, three P-47 aircraft left Westover Field in Chicopee, Massachusetts, for a formation training flight. While passing over the Westborough area, the flight ran into heavy clouds which extended low to the ground, and the planes became separated. One of the aircraft, (Ser. No. 41-6011), was piloted by 2nd Lt. Jack P. Lastor of the 340th Fighter Squadron. While encountering severe weather over the town of Cummington, he was forced to bail out of his aircraft. 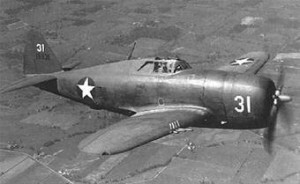 The P-47B went down in a pasture on a farm belonging to Leslie W. Joyner across from the Cummington-Worthington Highway. Lt. Lastor landed safely, and although suffering an injury, was able to make his way to a farm house to call for help. Another P-47 aircraft assigned to this training flight crashed in the town of Westborough, Massachusetts. In that instance, 2nd Lt. Charles C. Hay was killed when his aircraft, (Ser. No. 41-5924), crashed and exploded on Tob Hill. Springfield Republican, “Planes Crash In Westhampton, Cummington, December 1, 1942. Springfield Republican, “Second Army Pilot Killed; Three Crash In Two Days”, December 2, 1942, page 1.